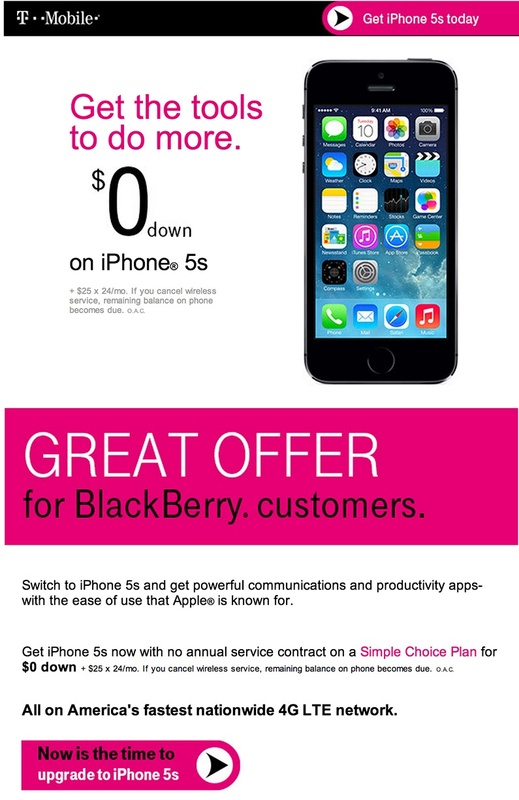 Last week, T-Mobile began new campaign targeting customers that own BlackBerry devices with an offer to upgrade to the iPhone 5s with no down payment. Word of the deal got to BlackBerry, and new CEO John Chen isn’t happy, in fact he says he’s “outraged” and he posted his thoughts to the company blog. “As we were never told of their plans in advance, I can only guess that T-Mobile thought its ‘great offer for BlackBerry customers’ would be well received. T-Mobile could not have been more wrong,” Chen wrote, urging BlackBerry fans to show their discontent through phone calls, emails, tweets and more to T-Mobile. Chen, who took over after a $1 billion dollar funding deal for the Canadian company last November, did offer some positives to BlackBerry addicts on T-Mobile, hinting that there is “an offer in the works” specifically tailored to them, though he provided no further details. T-Mobile CEO John Legere already responded to the complaints of BlackBerry fans over the weekend — before Chen’s post — stressing that the operator aims to provide choice and that customers do not have to give up their BlackBerry. BlackBerry users, I’m hearing you loud and clear. Let me work with the team and get back with you. On the face of it, Chen appears to have overreacted to the situation, given that Legere had already responded in public. It isn’t clear whether the BlackBerry chief has actually spoken to T-Mobile privately about the issue, but his post looks suspiciously like a shot from the hip aimed at generating publicity around BlackBerry. Chen is trying to build a comeback from the struggling firm, by the fact remains that its shipment numbers are tiny in the US — Kantar pegs it at 0.4 percent in the final quarter of 2013 — so operators are fully justified in pursuing campaigns that encourage users to switch to other devices. If BlackBerry can turn things around with new phones, then the situation might reverse, but shouting about it only highlights how irrelevant BlackBerry has become in the US.